Charles Burger Woodcock, created Freiherr Woodcock-Savage, later Charles Woodcock-Savage (1 May 1850 – 26 June 1923) was a New Yorker who achieved notoriety as the lover of King Karl of Württemberg, by some decades his elder. Charles Woodcock was born in New York City, the son of Jonas Gurnee Woodcock (1822–1908) and Sarah Savage Woodcock (1824–1893). Returning from a first trip to Germany in 1873, Charles had joined the Church of the Disciples, presided over by the Reverend Dr. George Hepworth. Woodcock graduated from seminary in Maine and was ordained as pastor of the Congregational Church in St. John, New Brunswick, Canada. Pastor Woodcock resided at the Victoria Hotel and soon became a prominent society man, spending his evenings in “entertainments.” It was whispered among some of the older boys of the town that Woodcock’s chambers in the hotel were often the scene of sordid stag parties. Woodcock was overextended financially, and troubles soon arose over reports of loose living and profligate behavior. Woodcock spent his mornings at St. John's leading bookstore, and it was there that he met Donald Hendry, a low-born Canadian who became his constant companion. Hendry was known to be where “the fun was best.” Popular, good-looking, affable and agreeable, Hendry was converted by Woodcock from his Baptist background to the Congregational faith. Invited by the Reverend Hepworth to make a Continental tour, both Woodcock and Hendry set off for Europe, ending up in Stuttgart. They met the King of Württemberg and developed a profitable intimacy with him. Charles Woodcock, who added “Savage” to his name (his mother's maiden name), became the constant companion of Karl. They were inseparable, going so far as to appear together in public dressed identically. In 1888 Karl named Charles Woodcock "Baron Woodcock-Savage" creating an uproar that sent Woodcock back to New York in 1890. When “Freiherr von Savage, Baron Woodcock,” the favorite of the King of Württemberg, returned to New York City, he moved in with his parents, ostensibly to “mourn his sweetheart,” a certain Miss Belle Carter, who had conveniently died a few months earlier. Claiming a female lover was his way of deflecting further innuendos about his intimacy with King Karl. Charles Woodcock-Savage later established a household with Donald Hendry in NYC, and they vacationed together in nearby Long Beach, New Jersey. During the summer of 1891 Charles and Donald hosted the Reverend George Hepworth and his wife at their cottage in Long Beach. On 14 June 1894, Charles B. Woodcock-Savage married a widow, Henrietta Knebel Staples, with four sons. Donald Hendry was his best man. On 19 June 1897, all of her sons (Joseph, Harry, Herbert, and Leslie Curtis) legally changed their last names to Savage. Leslie Curtis also changed his first name to Charles. They owned a house on Central Park West and 84th Street, NYC. In 1900 they bought and substantially reconstructed one of the Princeton’s finest nineteenth century houses. 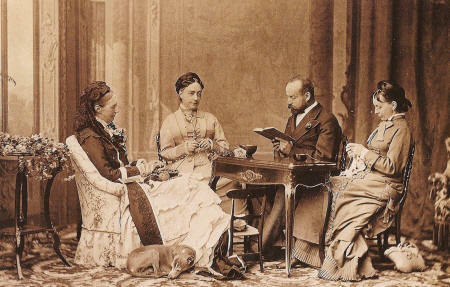 In 1906 Charles Woodcock-Savage published A Lady in Waiting: Being extracts from the diary of Julie de Chesnil, sometime lady-in-waiting to her Majesty, Queen Marie Antoinette (New York: D. Appleton and Company). He dedicated it "To a Noble Soul I Knew and Loved and Mourn." The King had died in 1891. The introduction gives a circumstantial account of the yellowed pages found locked in the secret drawer of a Louis Seize cabinet sold at the auction house of Hôtel Drouot and bought by the translator's dear friend from Paris days, an aesthete, who gives permission to publish. The memoirs offered in this frame story are in fact a novelistic pseudo-autobiography. Donald Hendry studied to become a librarian. By 1910 he was employed on the staff of the Pratt Institute Free Library, in Brooklyn, New York, and for twenty-four years headed its Applied Science Reference Department. Hendry retired in 1934, as a bachelor at the age of eighty. When Hendry died a year later, his New York Times obituary said that he had spent "eleven years in Europe as a private secretary," a way of publicly naming his years with Woodcock, who had died in 1923. At the time of his death, Hendry was living with Woodcock's adopted son, Charles R. Savage. Today, Hendry's gravestone in Trinity Cemetery (Riverside Dr. at W. 153rd St.), lies between those of Charles Woodcock-Savage and his wife.